In 2017 at re:Invent, AWS previewed a Kubernetes-based container service. Now six months later, the Elastic Container Service for Kubernetes (EKS) is generally available. It joins a crowded space of managed Kubernetes cloud services, each offering different functionality and deployment locations. In a blog post about the release of EKS, Amazon's Jeff Barr says that EKS "simplifies the process of building, securing, operating, and maintaining Kubernetes clusters, and brings the benefits of container-based computing to organizations that want to focus on building applications instead of setting up a Kubernetes cluster from scratch." EKS manages the Kubernetes control plane nodes, while it's up to the user to build and manage the worker nodes. The control plane is made up of the API server and etcd database. These managed nodes operate in a highly-available fashion across multiple AWS Availability Zones. 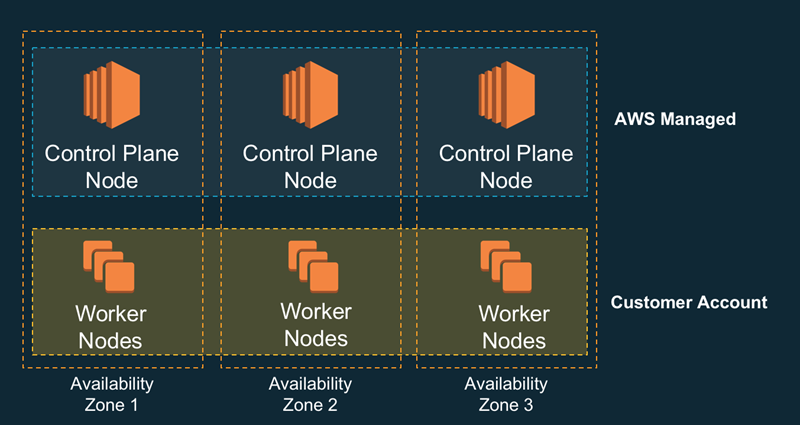 For worker nodes, AWS provides CloudFormation templates to provision the servers, and instructions for joining those servers to a cluster. Available in two regions at the moment—US East (N. Virginia) and US West (Oregon)—EKS has built-in integrations with other AWS services. This includes integration with: Identity and Access Management (IAM) roles for credentials, all three load balancer types for routing, Elastic Block Storage (EBS) for cluster storage, Route 53 for DNS, and more. AWS charges customers $0.20 per hour for the EKS control plane, plus the regular charges incurred for EC2 (worker) instances, storage, and load balancing. A recent survey showed that 57% of all companies running Kubernetes choose AWS as their host. This may be one reason why EKS launched alongside a compelling list of partners. Hashicorp announced Terraform support for building clusters. New Relic spelled out how they help monitor EKS clusters. GitLab shared how their app deployment and management capabilities now work with EKS. And Tigera shared their EKS networking support via Project Calico. Amazon EKS is one of many Kubernetes-based cloud services available in the market. Google Cloud offers up the Google Kubernetes Engine (GKE), which has been available since November 2014. Microsoft made the Azure Kubernetes Service (AKS) generally available on June 13th. Other public cloud providers like Oracle and DigitalOcean offer Kubernetes services as well. Add that to multi-cloud software products like Red Hat OpenShift and Pivotal Container Service, and companies have their pick of places to orchestrate containers. The Kubernetes services from the "Big Three" public cloud providers aren't identical. EKS doesn't provision worker nodes, while GKE and AKS do. Both GKE and AKS manage upgrades, while EKS does not. GKE is offered in all sixteen Google Cloud regions, AKS launched in nine regions, and Amazon EKS is available in two regions. The team at Replicated put together a table that compared these three offerings. In the blog post about the announcement, Barr mentioned that Amazon EKS will be expanding to additional regions, and add many new features throughout the rest of the year. Very nice news. Amazon should offer some form of free trial access to this new service and a brief getting started tutorial to understand principal Kubernetes concepts and a couple of mockup services to watch a whole K8 cluster in action.